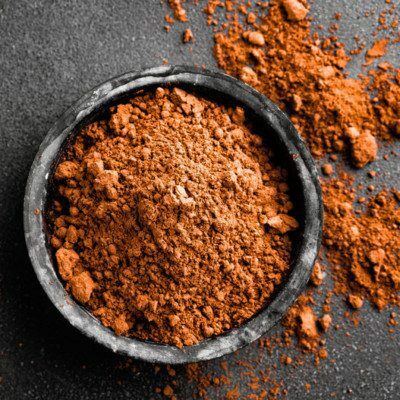 Cocoa powder is an ingredient that remains from chocolate liquor manufacturing typically used in baking to add color and flavoring to consumer products. It can be found in baked goods, icings, fudges, sauces and beverages. Cocoa powder—alternatively spelled “cacao”—is a substance produced from the seed of the cocoa tree. The Aztecs roasted and ground cocoa beans to make a drink called xocoatl. Other pre-conquest civilizations, including the Maya and Pipil–Nicarao, were also said to have used cocoa. This fruit-bearing tree grows large fleshy fruits continuously throughout the year along its trunk. The location of the seed pods on the trees, each containing 30 to 50 seeds, make it an easy product to harvest by hand. In fact, it is estimated that during harvest, a worker can pick around 650 pods per day, which is an amount sufficient to make roughly 65 pounds of chocolate. In baked goods, it is typically used at between 5 to 10 percent of flour weight. It may also be used in icing confectionery, sauces, and beverages. Since it is a powder, it should be stored in a dry, cool environment. Suas, M., and F. Wing. “Chocolate and Chocolate Work,”Advanced Bread and Pastry: A Professional Approach. Cenage Learning, 2012, pp. 941-991. Giacometti, J., et al. “Cocoa Processing and Impact on Composition.” Processing and Impact on Active Components in Food, 2015, pp. 605–612., doi:10.1016/b978-0-12-404699-3.00073-1. Nair, K.P. Prabhakaran. “Cocoa (Theobroma Cacao L.).” The Agronomy and Economy of Important Tree Crops of the Developing World, 2010, pp. 131–180., doi:10.1016/b978-0-12-384677-8.00005-9. Rupp, R.. “Can GMOs Save Chocolate?” National Geographic, National Geographic, 18 Mar. 2015, www.nationalgeographic.com/people-and-culture/food/the-plate/2015/03/18/can-gmos-save-chocolate/. Last accessed 11 December 2018. Biehl, B., and G. Ziegleder. “COCOA | Production, Products, and Use.” Encyclopedia of Food Sciences and Nutrition, 2003, pp. 1448–1463., doi:10.1016/b0-12-227055-x/00262-5. “CFR – Code of Federal Regulations Title 21.” Accessdata.fda.gov, www.accessdata.fda.gov/scripts/cdrh/cfdocs/cfcfr/CFRSearch.cfm?CFRPart=163&showFR=1&subpartNode=21:2.0.1.1.39.2. Last accessed 3 December 2018. “CFR – Code of Federal Regulations Title 21.” Accessdata.fda.gov, www.accessdata.fda.gov/scripts/cdrh/cfdocs/cfcfr/CFRSearch.cfm?fr=163.113. Last accessed 3 December 2018.